About 2-3 years ago, I tried my hand at felting wool, and took a few workshops. I loved making felted flowers, but had difficulty making ropes. Anyway, an exhibit was coming up, and I thought I would try getting back to the felting. This time, I didn't enjoy felting as much, but then I have a bum elbow, which made it hard to massage the wool for a long time. 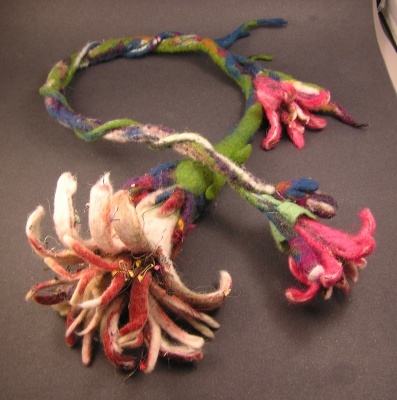 I still had a few felted flowers and a bunch of thick felt cords, so I put together 3 flowers and two cords together into this necklace, and put a few glass beads of mine inside the flowers. I'm inspired to finish 2-3 more necklaces with the remaining flowers and cords I have. Not sure what to call it - Vines and Flowers? Garland of Flowers? I'm open to suggestions.